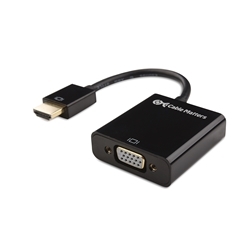 The Cable Matters® HDMI to VGA Adapter is the ideal solution for connecting a computer or other HDMI source to a display with full HD video. From the classroom to the conference room to the living room, this versatile adapter provides a convenient solution for displaying video or other content on a legacy display with VGA. The combination of gold-plated connectors with optional USB power in a lightweight package provides a portable adapter that is easy to carry and useful for many applications.